Here is an 1888 handbill advertising the publication of Anna Katharine Green's latest mystery: Behind Closed Doors. Anna Katharine Green helped develop the genre of detective fiction in America. Though a pioneering woman in mystery writing in the 19th century, she was not very progressive when it came to women and politics. She refused to support Women's Suffrage. But she did introduce, in The Golden Slippers and Other Problems, the character Violet Strange, one of the first, if not the first, female detectives in the genre. Green, whose image is found at online-literature.com, lived from 1846-1935. She was an aspiring poet, a correspondent with Emerson, and an influence on Agatha Christie. She published her first book in 1878, The Leavenworth Case: A Lawyer's Story, to critical and popular success and is best known for that work. By the end of her life, her work was all but forgotten. Patricia D. Maida has written about her life and work in The Life and Works of Anna Katharine Green. Here is a bookplate from Houston's M.D. 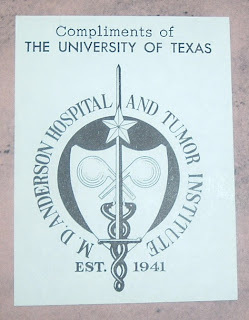 Anderson Cancer Hospital and Tumor Institute, as it was known in 1964. I found it in a book titled, The First Twenty Years: The University of Texas M.D. Anderson Hospital and Tumor Institute (1964). The center got its start in 1941, so this book covers 1941-1961. I presume the age of the bookplate corresponds with the publication date of 1964. The University of Texas M.D. Anderson Cancer Center, as it's known today, is arguably the best cancer research and treatment facility in the country, if not the world. I know from personal experience, unfortunately (and fortunately!) just how good they are. They saved my mother's life--brought her back from death's doorstep. I spent a good chunk of a year in and out of their hospital and various clinics (and every year since with follow-ups and procedures), and I still marvel at the experience our family had with that institution and its team of dedicated doctors and health care professionals. But don't take my word for it. This past year (2008), U.S. News and World Report selected M.D. Anderson as the best cancer hospital in America. 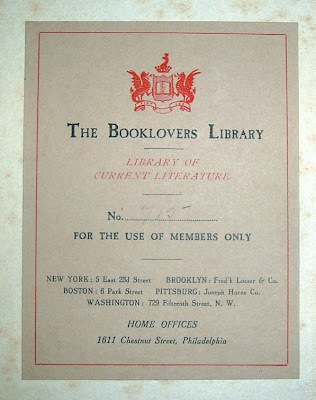 Here's a nice old bookplate, circa early 1900s, from The Booklovers Library, whose home offices were in Philadelphia. This informative ex libris also indicates other offices and their addresses for New York, Brooklyn, Boston, Pittsburg (sic), and Washington. It's subtitle, Library of Current Literature, narrows down what kind of books would comprise the library. If that sounds like a book club where subscribers received a new book each month, that's because it was. But subscribers did not purchase the books, they rented them. The Booklovers Library was founded by Seymour Eaton in 1900. 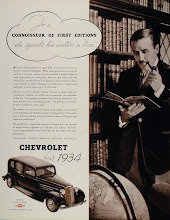 It was very successful within a short period of time, which inspired Eaton to start other enterprises, such as another rental library business (Tabard Inn Library) and the Booklovers Magazine. These attracted investors, who were paid dividends. Mark Twain was one of the more famous investors in Eaton's business. But the company overextended itself and there was some controversy about selling new shares of stock to pay dividends to the earlier investors. 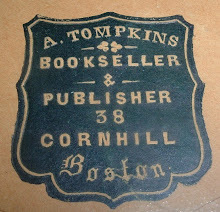 By 1905, the company was bankrupt, which creates a mystery for this bookplate. The book it resides in is The Yoke, by Hubert Wales, a 1908 printing from the Stuyvesant Press in New York. How did this bookplate, from a company that went out of business in 1905, find its way into a book published three years later? If the bookplate were blank, I'd guess it was one left over and somebody got their hands on it and made use of it. I don't think that's likely, especially because of the number 715 penciled in. This looks like a numbered volume in the library. Possibly, another company took over and continued the operations of the Booklovers Library. That happened with Booklovers Magazine, which was acquired by Appleton's. But I can't find any information on what happened to the library business, or why my numbered bookplate from a defunct library mysteriously appeared several years later in a contemporary book. The Wisconsin Library Heritage Center site has more information, with photos, about Eaton's enterprise. As his fortunes rapidly grew, he opened The Tabard Inn Library, offering the same type of service. Delivery, however was in the form of a revolving bookcase that could be placed in stores. The photo to the left is of such a device, complete with a receptacle for the five cents it cost to rent a book. libraryhistorybuff.com has some more images connected with this library that are of interest. Also, related to an earlier post I wrote about bookmobiles, this site also offers a wonderful article with fantastic photos here of historical bookmobiles. What became of Eaton? After the collapse of the Booklovers Library and related ventures, he got busy writing stories about bears named Teddy-B and Teddy-G, who had encountered President Roosevelt on his hunting trips. His syndicated stories became very popular and were collected in a number books. Eaton's stories helped inspire the creation of stuffed teddy bears. You never know where the history of a bookplate or other ephemera will take you. This trail has no end, but this post does. I know part of that title is correct because I copied it directly from the bookmark to the left, which features the Rocky Mountain Gray Wolf (canis lupus irremotus). As for libri vestigium, I was shooting for bookmark. Libri starts off in the right direction, but vestigium probably wobbled off course into the archaic definition of footprint or track. Close enough for bibliophemera concerns, eh? Because of Lauren's remarks about my blogs recently, I thought a bookmark was in order for my next post as a nod of the bloggin' cap to her and BiblioBuffet. The kind words are very much appreciated. I found this bookmark a few days ago in a copy of Platte River, by Rick Bass. A more appropriate book by Bass to shelter this bookmark would have been The Ninemile Wolves, his essay on the reintroduction of wolves into the Ninemile valley of northwest Montana. But because of that book and his other works, such as The New Wolves, The Lost Grizzlies, and Winter: Notes from Montana (my favorite), I think the Defenders of Wildlife, would be happy to have their bookmark reside in any of Mr. Bass' books. The artist who did the beautiful wolf drawing is Mark Maglio. His art work has graced other fundraising items for wildlife preservation organizations, according to this site for his book project. There, you can see other examples of the illustrative technique (pen and ink "stiple") it appears he used for this bookmark. These type of illustrations can take up to 100 hours to complete. This bookmark appears to be on the "endangered" list, as I can't find it anywhere on the Defenders of Wildlife site. So for that reason, as well as the extraordinary talents of the artist and the purpose behind the organization that published his work, I think I'll do a little preservation work of my own and retire this bookmark from active duty. It now has protected status in my bibliophemera collection. I can still remember the excitement I felt as a kid when the bookmobile came to our neighborhood. Climbing up into the truck into a world of books, I was like a kid in a candy store. Or I guess a bookstore. 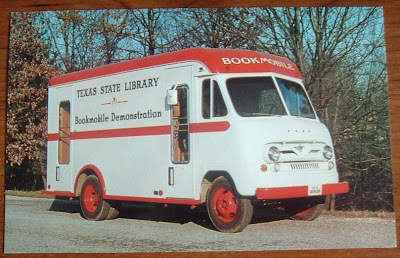 Here's a bookmobile postcard picture of the Texas State Library Bookmobile, circa late 1950s. The bookmobiles I remember were not much later than this one. This bookmobile has Bookmobile Demonstration printed on its side. Curious about that wording (was this a demo vehicle for libraries and other potential buyers? ), I did some digging and found the Federal Library Services Act of 1956, which helped counties promote and develop library services in rural areas. It also helped urban areas cope with a rapidly growing suburbia. Bookmobile demonstration projects helped promote the growth of rural and suburban community library systems. So the Texas State Library must have gotten funding to send the Bookmobile Demonstrations out into needy areas to promote the need for community libraries. But I also the found Bookmobile Demonstration on the back of one of the photos (dated 1939) in this fine Nebraska collection. So obviously, the term did not arise from the 1956 legislation. 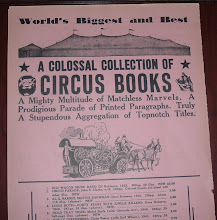 I suppose library demonstrations go back to even the days of Parnassus on Wheels. Speaking of which, I found reference to Christopher Morley's Parnassus on flickr.com along with a nice collection of bookmobile photos. 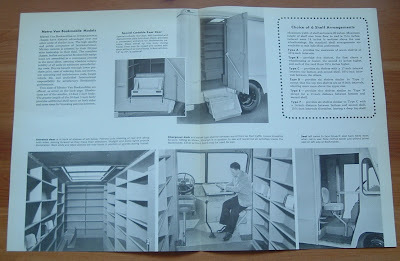 I had not given much thought, if any, to bookmobiles in many years until I came across this and this on Exile Bibliophile awhile back. That sent me looking for a piece of nostalgic ephemera from my youth and now I have it in the form of the postcard above. So where have all the Bookmobiles gone? I haven't seen any in years, so I started poking around the Web and I'm happy to report that they seem to be alive and kicking. Sure, there are plenty of stories about their demise because of lack of need or funding. 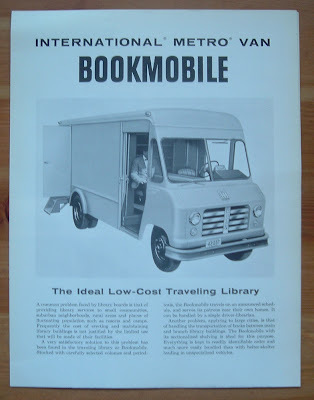 Perhaps the mission of the Bookmobile Demonstration succeeded in helping communities realize the need for a library and their subsequent development ushered in the decreasing demand and eventual elimination of some. But the Bookmobile keeps rolling in many communities around the country. Around the world for that matter. Checking the blogosphere, I find bloggers blogging about bookmobiles from a Vermont librarian to a Roanoke, Virginia photographer to Gertie down in South Louisiana. There is even a four-legged (not wheeled) version of mobile book transport called the Biblioburro. And while some libraries have had to discontinue their bookmobile service, others are getting service started in their communities, such as the Salinas Public Library in California. 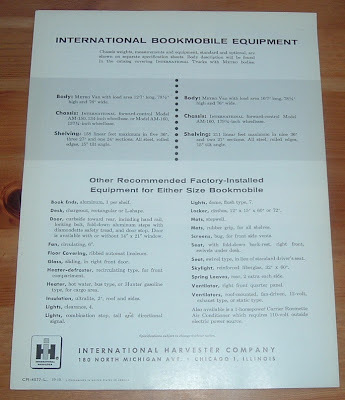 And for community libraries in the market for a bookmobile, are there brochures like this anymore? 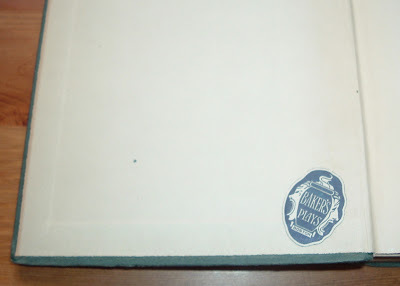 The labels I find inside books usually consist of bookplates, book shop labels, school labels, etc. Now I can add radio station labels to the list. My first one of these is from KTIS in Minneapolis, the radio voice of Northwestern Schools (Bible School, College of Liberal Arts, and Theological Seminary). This promotional label for both the radio station and the college that owned it could date back as far as 1949 because the KTIS came on the air that year. 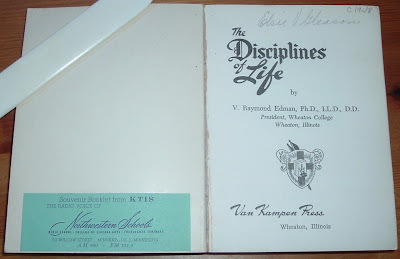 The book it was found in is a later printing of the The Disciplines of Life, by V. Raymond Edman (1948). Without knowing the printing history of the book, my fourth printing could have been in the following year or in any year after that, up to the time zip codes began. The address on the label has Minneapolis 3 Minnesota. Another clue is the FM station indicated on the label. FM radio got started in the 1930s, but didn't begin to flourish until sometime after its inventor's suicide in 1954 (interesting FM history here). Likely, this label dates closer to 1960, giver or take a few years. KTIS, and its Christian programming, is still on the air all these years later and it looks like they will be celebrating their 50th anniversary this year. I haven't found any mention of this, though, on the KTIS Web site. Fifty-year-old radio stations are not that unusual. But 50 years of the same format seems very unusual. KTIS started out with a religious/Christian format and they are still humming along with basically the same format--radio programming for a Christian audience. Not only that, but they are still owned and operated by Northwestern College (nee Schools). Of course, being owned and operated by a theology-oriented college probably accounts, to a large degree, for the longevity and consistent format. The Houston area market I live in has seen so many format changes among its radio stations, especially in the last 10 years, that I can't think of any that have the same format they had 50 years ago. The biggest change I can find with KTIS is their location. They moved all the way from Minneapolis to their Twin City location of St. Paul. Many years ago, though, in Minneapolis, KTIS gave away a copy of The Disciplines of Life and affixed their "souvenir booklet" label on it. And now it's a unique "souvenir" in my collection of bibliophemera. 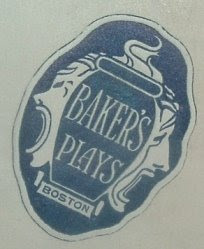 Here's a trade label for Baker's Plays, a Boston book shop devoted to playwriting and the theatrical arts, as well as publishing titles in that field. I found it in a copy of Dear Brutus, by J.M. 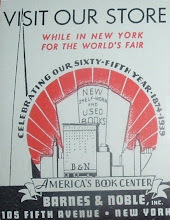 Barrie (Scribner, later printing, 1928). I have no way of knowing (yet) if the label is contemporary to the book's printing. If the book shop sold used books, the label could have been affixed in one of several succeeding decades. It's a nice label with raised letters and a drama mask design befitting the shop's specialty. Baker's Plays still exists, though. Their Web site lists a New York address, but I also found mention of a Quincy (Boston) location. From a Bibliography listed at Heniford.net, I learned this: "Since 1845, Baker's Plays has supplied playscripts and performance rights, adding through the years theatre books, stage makeup, sound effect and dialect tapes." Quite remarkable, if I have my facts right. This must be one of the oldest running book shops in the country. And writing that sentence prompted me to search for something older than 1845 in America. Didn't have to go far to find it--the Brattle Book Shop in Boston, 1825. There must be more, but it will require more research than I have time for at the moment. But I did find a site that seems to be collecting old book shops on the European continent: bookstoreguide.org. And then there's India's oldest bookstore, Higginbothams in Chennai... uh oh... this is getting away from me. Back to Baker's Plays, I did a search of their site to see if they had a copy of my J.M. 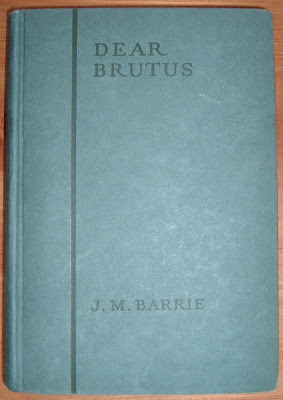 Barrie book, Dear Brutus. The only Barrie title they had was Peter Pan. 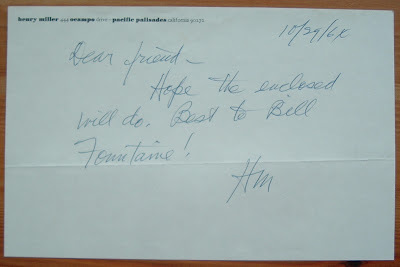 In 1964, bookseller/bibliophile Paul H. North, Jr. wrote a letter to author Henry Miller requesting inscriptions in a few of Miller's books he had purchased from a mutual friend or acquaintance. That letter is pictured below. Miller replied directly on the letter and enclosed inscriptions on articles of some kind. He also included a brief note on his own letterhead (below). 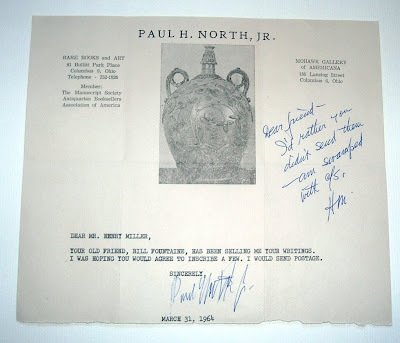 Miller evidently didn't want to be bothered with receiving and mailing packages of books, as indicated by his reply on North's letter, and hoped his enclosed signatures would suffice (stated on Miller's note below). 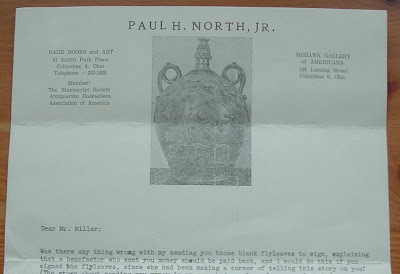 This correspondence came into my possession a few years ago and included a follow-up letter from North, in which I learned that North had sent Miller some blank fly leaves for signatures. Miller apparently signed and returned them with the note above. North thanked him for it, but seemed perplexed about the reactions of another mutual friend for his having corresponded with Miller. The fly leaves might have been sent to Miller after North received a reply to his first letter. Miller did enclose something in his reply to North's first letter, so why would North send him blank fly leaves for more signatures? I assume he wasn't quite satisfied with what he got and pressed for something more. And it would appear that Miller was kind enough to oblige. But there is more to this story, which I may report on if I can ever piece it together. In a follow-up letter to Miller, thanking him for the signed fly leaves, North seemed puzzled about something toward Miller and angry toward the second mutual friend. He apologized to Miller for any intrusion on his time, but had some less-than-complimentary comments about the character of the mutual friend. Because of the relatively recent year (relative to the older ephemera posted on this blog) of the correspondence and the names mentioned in the letter, I won't post an image of the entire letter here. I doubt any of those involved in this correspondence are still alive, certainly not Miller. And North seems to have passed away, as Internet searches reveal that some of his personal collection (i.e., signed Steinbecks) with his ex libris are residing in the inventory of other booksellers now. From Noyes' Book Store in Suncook, New Hampshire, here's a trade card depicting rowers practicing for a race, with the additional caption of "Now all of yis pull together." A metaphor for success in the new year? As the years 1881 and 1882 are indicated on the card, I would assume this holiday greeting is for the Christmas/New Year's holiday season--the end of one year and beginning of the next. As we transition through the holiday season, this bookseller wishes healthy, happy, and prosperous rowing for all as we enter the 2009 race.